Once upon a time radio meant a tune in the parlor or a news broadcast. 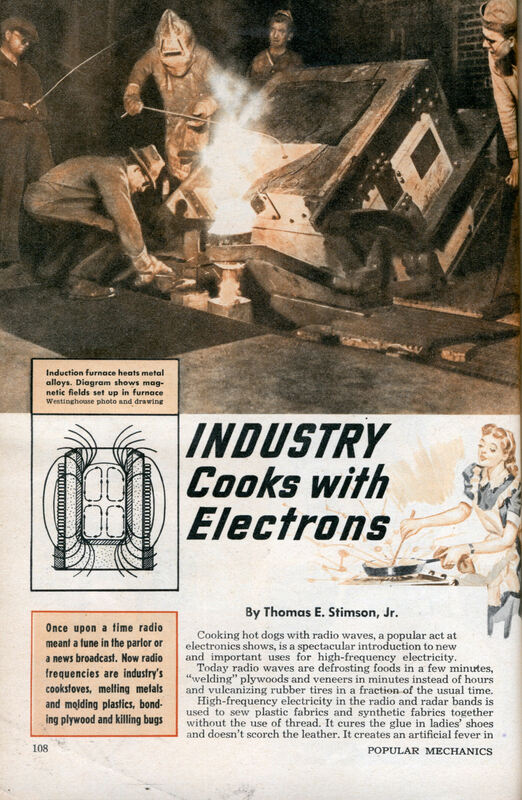 Now radio frequencies are industry’s cookstoves, melting metals and molding plastics, bonding plywood and killing bugs By Thomas E. Stimson, Jr. Cooking hot dogs with radio waves, a popular act at electronics shows, is a spectacular introduction to new and important uses for high-frequency electricity. Today radio waves are defrosting foods in a few minutes, “welding” plywoods and veneers in minutes instead of hours and vulcanizing rubber tires in a fraction of the usual time. High-frequency electricity in the radio and radar bands is used to sew plastic fabrics and synthetic fabrics together without the use of thread. It cures the glue in ladies’ shoes and doesn’t scorch the leather. It creates an artificial fever in the human body for relieving pain and fighting infection. Radio heat hardens the bearing surfaces of crankshafts and puts a superhard finish on the cylinder walls of internal combustion engines. It solders metals faster than they can be soldered by hand. In a single operation alone, that of “flowing” electrically deposited tin plate to smooth and brighten its surface, more than 2% times the power of all the radio broadcasting stations in the United States is used. 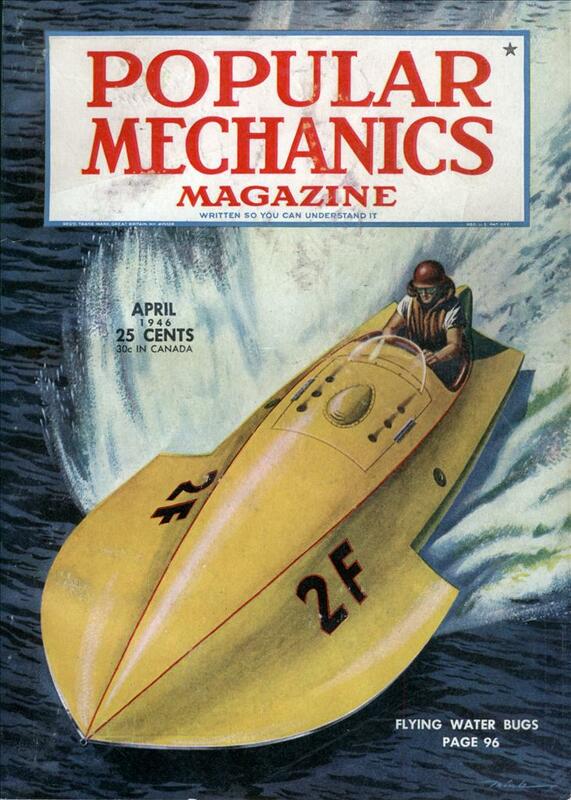 The 92 miles of wood reinforcing angles that were used in the construction of the 225-ton Hughes flying boat were manufactured by means of radio heat. The sturdy laminated beams used in the hull and the subassemblies of the boat were joined with the same high-frequency heat. Soon radio may be used in the construction of homes by immediately curing the glues that are replacing nails for some purposes. It promises to kiln-dry lumber in less than an hour. Green lumber is put into a kiln to which a high-frequency current is applied for a short time; this draws the lumber’s moisture content down to any desired amount without checking or warping. Electronic heat may be used for the curing of alfalfa and other hays that are subject to spontaneous combustion during the drying process. It has been used to sterilize cereal foods and other packaged products. It shells cocoa beans and roasts both cocoa and coffee beans. An electronic stove for the housewife has been proposed, but engineers are not yet ready to concede that it would be practical. The cooking of nonhomogeneous foods such as meat that contains fat and bone still requires further investigation. Heating your home electronically is in the same category. It’s possible in theory but would be too expensive at present. In the past, heat usually has been applied by conductive methods, that is, transferring heat by contact. In some applications conductive methods do more harm than good. Wooden furniture, for example, would have its outer surfaces burned if enough heat were applied to dry out its interior glues in a hurry. To avoid this the furniture must be set aside for days to allow the glue to dry. If heat is applied by ordinary methods to the teeth of a gear wheel to harden them, the whole wheel absorbs the heat and becomes brittle. High-frequency heat, on the other hand, is applied just where it is neededâ€”internally in the case of the furniture, externally in the case of the gear wheel. The surfaces of the gear teeth become red hot in a couple of seconds; the metal then is quenched before the heat affects the interior. Heat is “crowded” onto the surface of a metallic conductor such as the gear wheel by the induction method â€” placing the wheel in the magnetic field of a high-frequency induction coil. Heat is created inside a nonconducting substance such as wood by the dielectric methodâ€”placing the material between the plates of a condenser to which high-frequency electricity is applied, causing molecular agitation. Induction heating has become a standard industrial process. It melts tool steels and other special alloys. It is used in annealing and heat-treating processes. A low-frequency current of about 1000 cycles is the most efficient for such work. At higher frequencies the heating effect is shallow and at ultra-high frequencies the direct heating action affects the skin of the material only, without heating the interior. Electrical engineers put this phenomenon to work in a dozen different ways. The bearing surfaces of practically all crank- shafts for aircraft, tank and Diesel engines now are hardened inductively. It takes about two minutes to place the special inductive collars around a 13-bearing crankshaft, heat the bearing surfaces red hot and quench them. Rocker arm shafts for aircraft engines are hardened similarly at the rate of 1000 per hour. Interiors of automobile hubs are hardened by inductive heat, and even the cutting edges of chisels receive a local heat treatment that doesn’t affect the toughness of the rest of the is being studied in the fields of dehydration, the drying of oils and in creating chemical reactions requiring “inside” heat. Merit Shortwave Diathermy Company of Los Angeles, a manufacturer of artificial fever machines for medical use as well as industrial dielectric units, has developed an electronic heat gun that dispenses with the two electrodes that are usually required for dielectric heating operations. The gun consists of one electrode at the end of a coaxial cable. It produces heat in a dielectric material when it is held against the material and the trigger pressed. Adapted for heat “tacking” and for curing glues in furniture manufacture and residential construction, the gun contains a small neon lamp that glows bright red as soon as the glue is set. Thin pieces of wood and glue are permanently bonded by the gun in a couple of seconds and thicker material “welded” in less than a minute. Explosive rivets have been developed to facilitate riveting where only one side of the rivet can be reached. By applying heat to that side, a small explosive charge is set off that completes the riveting job instantly by spreading the “blind” end. Heating the heads of these rivets is now done quickly and simply by use of a radio-heat gun that induces electric currents in the rivets. Electronic heating of high explosives is much more satisfactory than other heating methods. It is easier to control and heats such dangerous materials much more uniformly, an important safety factor. One of the major advantages of dielectric heating is its speed. During the war airborne plywood rescue boats weighing over 1-1/2 tons were developed to be dropped by parachute to flyers lost at sea. The total production time of each boat with original methods of construction was six months. With an electronic generator, production time dropped to 26 days. And rejected work was reduced from 40 percent to 2 percent. High-frequency electricity for either induction or dielectric heating is created by electronic generators of the vacuum tube type. The circuits are essentially those of short-wave radio transmitters. Frequencies are confined to bands that will not interfere with shortwave radio communication. Certain frequencies appear to be the most effective for heating certain materials although in a general way the greater the frequency the more rapid is the heating effect. Radio heat is much more efficient than most conventional kinds of heat. An electronic generator normally is 50 to 75 percent efficient, the remainder of the power being disposed of as waste heat. An automobile engine is only about 30 to 35 percent efficient, an incandescent lamp less than 10 percent and a steam locomotive about 8 percent. Because electronic heating devices have few moving parts they require little maintenance. Tubes often give a year or more of uninterrupted service. The equipment for radio heating does not produce vibrations which might have a serious effect on the material being treated. High-frequency heating of either type is quite expensive. It’s far cheaper, for example, to boil water by building a fire under the pot than it is to boil the water by using radio waves. High-frequency heating has little advantage in operations where temperatures are not critical. On the other hand it often produces a result that is impossible with other heating methods, it increases the speed of a process, confines the heat to the desired area, and is clean and compact. Not all of its possible applications have been investigated yet. Further uses are being developed. For this purpose Westing-house Electric is opening three regional high-frequency heat laboratories where the practicability of heating various products electronically by beaming short waves to them is being studied.